There’s something about opening your eyes in the morning and knowing from the colour of your world that the sun is out. It was a wet and windy night, so the sunlight feels even more precious. It lights me up on the inside, not just the outside. I find it soothes my weariness and any anxieties, causing a certain relaxation to flood through me; even as I go about my day working on this and that, I feel a kind of release. 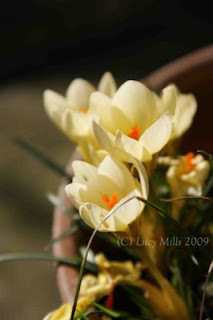 I was rather pleased with the crocus picture I posted on Monday; apart from the watermark and compressing the file size what you see is what was taken, the same with the images in this post – no later changes or tweaking to the images. I love the sight of these tiny flowers peppering the dull ground with the vibrant colour of hope; they awaken the tiny flowers of hope in my heart’s garden, inspiring me to thankfulness and expectation of joy. The photos are so lovely, thanks. We must be a little behind you in the season. Still no flowers yet. Nice to look forward to them!